Many different styles of Tomcat Floor Scrubber Dryers are available for your company. Listed below are some examples of the Walk Behind and Rider Floor Scrubber Dryers that are tailor made for your specifications. The Tomcat EDGE® Stick Machine is the ultimate floor stripping machine. From completely stripping off floor finishes to just caked on layers of dust and dirt, this machine is very powerful. Tomcat's CRZ Rider Floor Scrubber Dryer is known for its simple design and durable construction, offering unmatched value for the customer. The CRZ Floor Scrubber Dryer comes equipped with a powerful front-wheel drive for climbing ramps and max operator ease. Tomcat's EX Rider Floor Scrubber Dryer is known for its simple design and durable construction, offering unmatched value for the customer. The EX Floor Scrubber Dryer comes equipped with a powerful front-wheel drive for climbing ramps and max operator ease. While keeping with the constant durability that Tomcat machines have to offer, your operators will find the EX Floor Scrubber Dryer easy to maneuver and simple to service. The deck is protected by the steel frame and large polyurethane rollers to keep the unit from marking walls. The EX Scrubbers are available with Disk and Cylindrical scrub heads. Tomcat's HERO Floor Scrubber Dryer is known for its simple design and durable construction, offering unmatched value for the customer. The HERO Floor Scrubber Dryer comes equipped with a Traction drive which includes a powerful all-gear transaxle for climbing ramps and max operator ease. The Tomcat NANO EDGE® stick machine is a game-changer when used in stairwells. With perfect size stair pads, to ease of transportation, this machine is a must have for multi-level buildings. 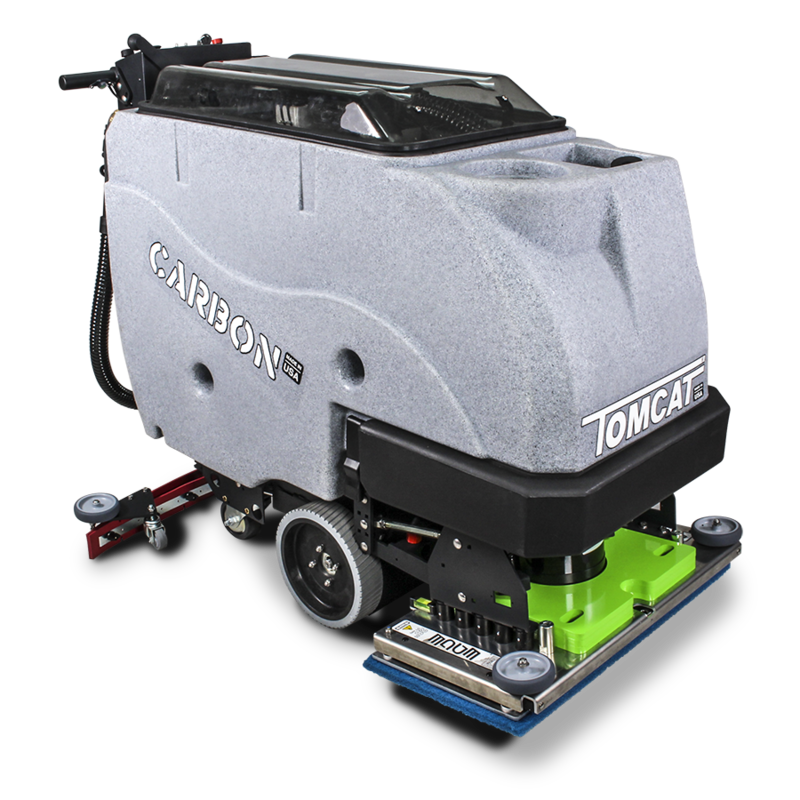 Tomcat's PRO Floor Scrubber Dryer is known for its simple design and durable construction, offering unmatched value for the customer. The PRO Rider Floor Scrubber Dryer comes equipped with a powerful all-gear transaxle for climbing ramps and max operator ease. Tomcat's RECON Floor Scrubber Dryer is known for its small, simple design and durable construction, offering unmatched value for the customer. The RECON Floor Scrubber Dryer comes equipped as a Pad Assist or Traction Drive machine. The Traction drive unit includes a powerful all-gear transaxle for climbing ramps and max operator ease. Tomcat's SPORT Floor Scrubber Dryer is known for its simple design and durable construction, offering unmatched value for the customer. The SPORT Floor Scrubber Dryer comes either as a Pad Assist or Traction version. Tomcat's XR Floor Scrubber Dryers are tough, compact scrubber dryers that offer the great productivity of Rider machines but with better maneuverability than Walk Behinds. The Tomcat XR Floor Scrubber Dryers have a powerful drive motor that can climb steep ramps and comes standard with heavy duty tires. Features of the drive system include: automatic parking brake and reducing of transport speed while scrubbing or reversing to maintain life of the squeegees.